Have you remembered Sinclair’s ZX Spectrum? Now the old-school gaming computer have revived with a new appearance. Curious? let’s go on check the following ZX Spectrum Vega gaming computer. The ZX Spectrum Vega is a budget friendly gaming computer based on Spectrum products of the early 1980s. As shown in the images, similar with its predecessor ZX Spectrum, the new gaming computer also sports a sleek, compact design for easy to hold with your hands, but ZX Spectrum Vega features a gaming friendly D-pad and five buttons instead of an integrated keyboard layout in order to bring you more comfortable gaming experience. Using an included cable, you can easily connect the gaming computer with your TV, enjoying around 1,000 built-in games. Apart from that, its SD card slot allows to load more games onto the gaming computer. After the break, check out the following demo video. 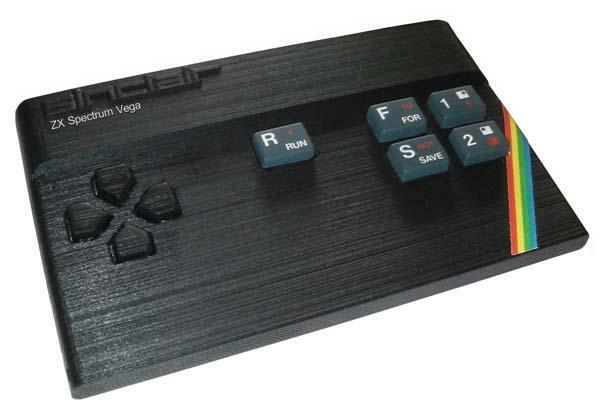 The team of Sinclair ZX Spectrum Vega is raising fund via Indiegogo. You can pledge £100 (approx $156 USD) to own the gaming computer. If you’re interested, jump to Indiegogo official site for more details.